To Sum It Up: Renowned and feared as Adarlan’s greatest assassin, Celaena Sardothien’s luck finally ran out. Sentenced to hard labor in the Salt Mines of Endovier, she’s been there for a year when she’s offered an unusual bargain for her release. All she needs to do is win the upcoming competition to become the King of Ardalan’s next Champion, i.e. the person who does all of his dirty work for him. The stakes are high for Celaena, as she’ll not only be vying for her freedom, but she’ll also be representing Ardalan’s Crown Prince, Dorian Havilliard, in the contest. Although not entirely pleased with the terms, Celaena cannot let this opportunity escape, but winning won’t be easy, especially when someone begins killing the competitors. 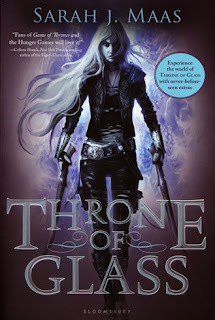 Review: So, after my usual routine of adding a much buzzed about book to my TBR list then waiting months and months to read it, I finally picked up Throne of Glass. In a way, I’m happy that I waited, because I really dig the cover of the paperback. Celaena, the heroine, looks pretty badass, and this is one pretty badass book. I’ll say off the bat that I’d expected Celaena to show off more of her self-proclaimed super awesome assassinating skills than she did. Celaena devotes a healthy percentage of her thoughts to detailing how easily she can kill someone or escape from the palace, but that’s all they are—thoughts. Sometimes I couldn’t help but laugh at how gargantuan her ego was, while at other times it made me roll my eyes. If it weren’t for other characters like Prince Dorian and Chaol Westfall, the Captain of the Guard, calling her on her bluster and telling her to back up her bragging with an actual display of what she was capable of, I would have become weary of her high opinion of herself. But Celaena also possesses a vulnerable side of which there’s a glimpse here and there, and that, too, went a long way in helping me look past her self-admiration. By the conclusion of Throne of Glass, I liked the character she’d grown into, flaws and all. Chaol and Dorian. Dorian and Chaol. I kept wavering over whom I loved more: Dorian, with his irrepressible charm and wit, or Chaol, the quintessential Captain of the Guard who’s equally adept at returning Celaena’s verbal jabs. Chaol gained a slight edge over Dorian toward the end of the novel, but I seriously love both characters. Lucky, lucky Celaena. This book had a compulsively readable quality to it. While not everything that happened came as a surprise, that didn’t hinder me from becoming immersed in this world. It’s a richly drawn fantasy world, too, rife with court drama and topped off with a coating of magic. In other words, this is everything a fantasy novel should be. The competition to determine the King’s Champion provides quite a bit of action, not to mention a multi-victim murder mystery. What most absorbed my interest, though, was watching Celaena grow to care for Dorian, Chaol, and Princess Nehemia of Eyllwe, and them for her. Celaena’s friendship with Nehemia, an outsider who’s viewed with suspicion by Ardalan’s courtiers, is particularly sweet; here are these two smart, strong young women who don’t exactly fit in with everyone else at court, and they find a kindred spirit in one another. All four of these characters spring off the page with their depth and realness. I really enjoyed the story, but it was the characters who made this book for me—yes, even Celaena, in all her haughty glory. All in All: Celaena is kind of the wildcard here with her personality. Some may find it exhilarating, some may find it grating, and still others’ opinions may fall between the two. I wasn’t always her biggest fan, but in the end, she was a heroine I could totally root for. Have you read the prequel novellas? I felt the same way re: C's assassinating skills. I felt it lacking but she totally brought her game back in Crown of midnight. I read your review of CoM, and I'm really looking forward to seeing Celaena put her skills in action. I haven't read the novellas, and with the announcement that they're going to all be available in a printed book with a new story, I'm thinking of just waiting for that to come out. I'd bookmarked your review when I saw it since I was still reading this one myself but now that I'm done I'm free to read your thoughts :D We seem to have loved this one exactly the same amount lol! Anyways YES I also loved Celaena, flaws and all! I thought she managed to pull off that insane amount of swagger that she had and she definitely puts her full capabilities on display at the end! Yay! So glad that you enjoyed Throne of Glass, too! I totally agree with you that the love triangle looks like it's going to be quite the painful one. I'm rooting for Chaol, but I'd hate to see Dorian heartbroken, too. Gah! These triangles really wreck me sometimes, and I'm not even the one who's in the middle, lol. And I'm already prepared to spend from Tuesday onward buried in my copy of Crown of Midnight as soon as it arrives.